I have just returned from a night out to the inaugural British Surf Film Festival in Newquay. The new WTW Lighthouse Cinema hosted the event and my friend Karl Mackie was one of the organisers. There has been a buzz surrounding the event over the past few months. Newquay has a large population of surfers of all ages who have made the sacrifice of low wages for a better standard of living, and the ability to surf as often as possible. It is really exciting to have an event that has been directly targeted this community. The new Lighthouse Cinema opened this spring, and has already dipped its toe into the water with a few surf films. It screened Rio Breaks, a documentary about two best friends from the favelas and their life in the slums and surfing at Arpoador Beach, in Rio de Janeiro. It also held a Surfers for Cetaceans event where we saw Dave Rastovich’s movie Minds in The Water followed by talks by the surfers, directors and producers of the film. The Lighthouse was a great venue for the film festival with its large atrium and multi screens. A band played, canapés were served and drinks were available from the bar. A red carpet was laid for Bethany Hamilton, the inspiration for the film Soul Surfer, which was premiered at the event. There was a good turnout from Newquay’s finest, dressed in their glad rags. Although Bethany Hamilton’s story is inspirational, Soul Surfer (a Disney production) was not for me. I did however see two other films tonight. Thirty Thousand – a beautifully shot surf travel movie by Richard and Andrew James. The premise of the documentary is two brothers who undertake a trip from Casablanca to Cape Town surfing the west coast of Africa as they go. This was eloquently narrated and unpretentious. The mellow, retro style surfing of the James twins was a joy to behold. Last Paradise – an unintentionally funny documentary about the pioneers of extreme sports in New Zealand in the 60’s and 70’s. The stars of this movie, included AJ Hackett the founder of bungee jumping (who looked as if he’d done one too many), truly had a screw loose. I left with a longing to emigrate and live within spitting distance of Manu Bay, Raglan. The British Surf Film Festival continues tomorrow, when a film competition will also be held with a screening of the entrant’s submissions. A great event, I hope this becomes an annual occasion! This time I have almost left it too late. Less than 2 weeks to go and I have only made it to the gym a few times. At least October in France is hardly bikini weather. Spin class on Monday, a night off and then Spinning again followed by Boxercise on Wednesday. It doesn’t take long to get back into a routine. After the Three Peaks Challenge this July and all the training, as well as the little bit of running I did, I am not too unfit. I might have some love handles but at least my legs didn’t ache after the fitness instructor made me cycle up an imaginary hill for half an hour! I just need to add a toning class and some cliff walking (and some willpower to keep me away from cakes) and I will be ready for lung constricting winter surf. Brrr! A breezy September afternoon and my hangover is mirrored by the Town. The streets are vacant and shivering as Newquay clinks and clatters in the wind. 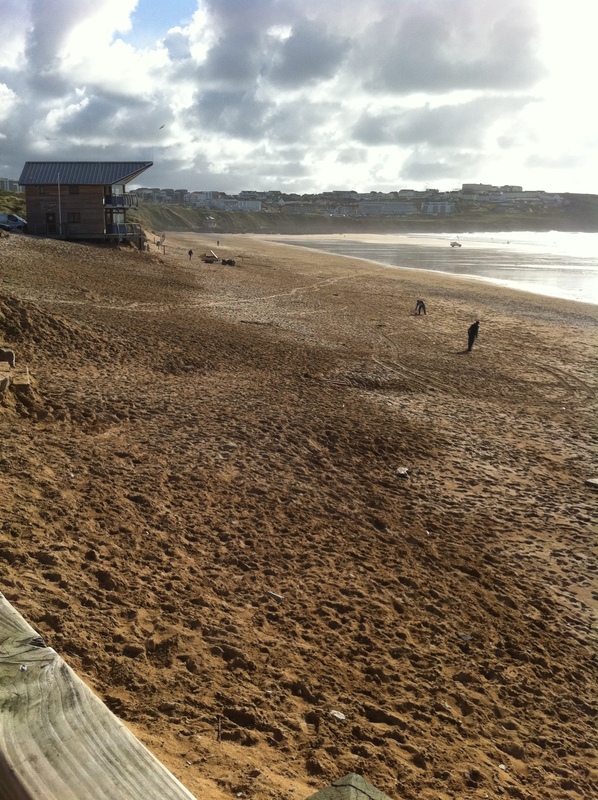 The holiday makers are mostly gone, and Newquay goes about its business. Muted and lifeless compared to the thump and bustle of summer. Proprietors stare blankly, their shops quiet. A hen do straggles from bar to bar, a gust snatching at their feather boas. A surf school struggles down beach road. Heavy swell boards under arm in their uniform of wetsuits and flip flops. Love it or hate it, on an August afternoon the town is alive. Newquay is pumping (unlike the surf), with music blaring from the bars. Thousands flock to the town, to party or just to see the spectacle that is Newquay in the summer. 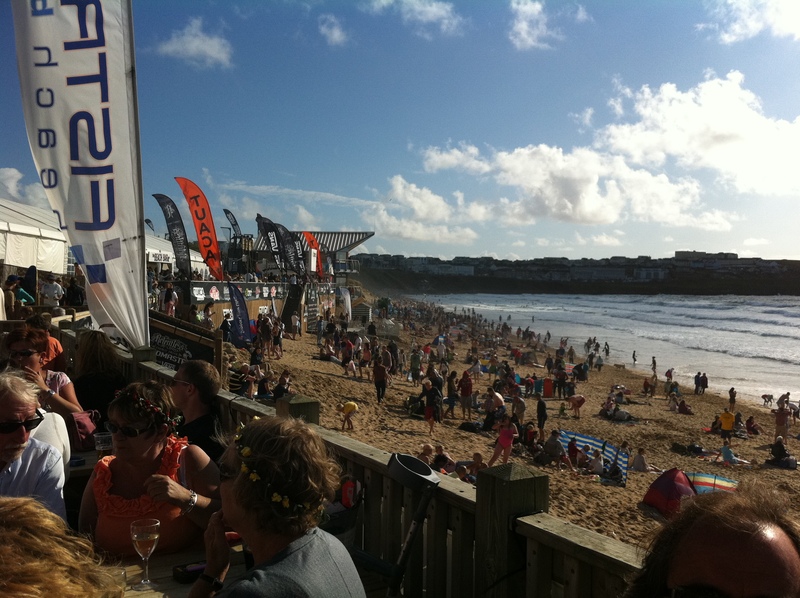 Fistral beach is transformed as the travelling show of competitive surfing dips its toe into the town. A Saturday afternoon six weeks later and Fistral is almost deserted, bereft of human clutter and exposed to the elements. Like the morning after the night before, the silence is deafening, with the Autumn breeze ringing my ears instead. 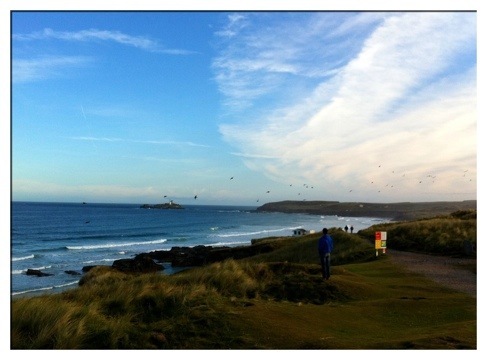 Godrevy – the morning after the night before! A group trip was organised to the Hall for Cornwall’s open air screening of the early 90’s classic Point Break on the Godrevy headland. A motley crew gathered at the lovely Gwithian Farm campsite, undeterred by a turn for the worse from the Cornish weather. Thoroughly bedraggled from the lashing wind and rain, we made our way to the headland, not before sampling the finest ales on offer at the Red River and the the Sandsifter. Our perseverance was rewarded. The skies cleared just in time for the film and we were treated to a view of Glow Worms glittering in the long grass along the cliff top. Despite having fun in the surf at Mawgan Porth this afternoon, I surfed like a kook. The conditions were perfect for longboarding, glassy, wedgy and with the setting sun, almost like a scene from the Endless Summer. The surfing was far from it. My arms flailed when paddling. I slid off the front of the board, legs akimbo. I stepped on the rail and generally wobbled and lurched around like I’d never surfed before. Why, you ask? The reason is that I am a short boarder at heart. Whilst I love to cruise on a log, my dream is to rip, shred and hack. I want to chuck my board around, flinging arcs of spray in the air like a pro. I am under no illusions, I am far from it, but I do know that I am much happier with less foam under my feet. Tomorrow, with a bit of swell, I will be back on a 6′ something. Although I have yet to retire my longboard (I will learn to cross step), pushing myself on a smaller board is where it’s at for me right now.